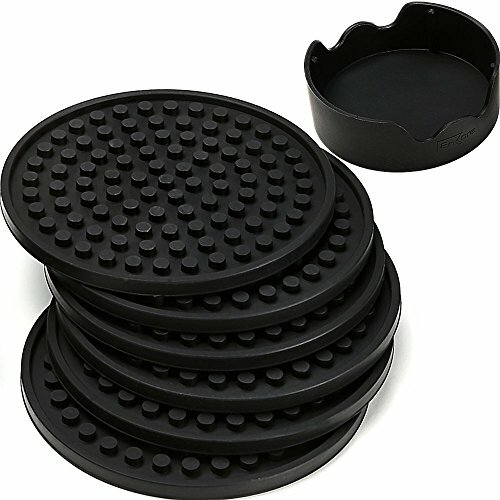 Our built to last, multi functional silicone coasters are 4.3" (11cm) in diameter in a matching caddy. They accommodate almost any size of cup or mug. Constructed with a deep grooved tray, our coasters contain condensation from your cold beverages to protect your table, counter top or other surfaces. The anti-slip design keeps your drink from slipping and sliding, without sticking to the bottom of your cup. Products of Enkore in new condition is only available on Amazon from HomeFocus. We do NOT allow anyone to re-sell our products for the reason of brand integrity and quality control. Products sold elsewhere other than this product page should be considered as counterfeit or second-hand which are not covered by our warranty. KEEP YOUR FURNITURE FREE FROM STAIN OR DAMAGE - Big 4.3 inch (11cm) size Suits ALL Cups and Mugs, making them excellent bar tools and accessories. Being the largest size coaster in the market, you will never have spillage since your Drinkware is well contained but not stuck to the bottom. DEEPER GROOVED PATTERNS ON BOTH SIDE PROTECT YOUR FURNITURE FROM EXCESS LIQUID FROM COLD BEVERAGE, Whiskey, Cocktail, beer or alcohol. They will never leave any mark on your wooden table or bedstand. More wooden surface friendly than sandstone. FOOD GRADE SILICONE MAKES ECO-FRIENDLY & DISHWASHER SAFE TABLEWARE. It means they are multifunctional and can be used as home decor, spoon rest, barware set, bar service mat, bartender supplies or Table pad. Stay put and kid friendly. ARE YOU SCRATCHING YOUR HEAD TO FIND THE PRACTICAL AND COOL LOOKING GIFT FOR SOMEONE? - This coaster-set makes a great Housewarming, Birthday, New Year Gift for Mother, Father, him, her, man, woman. Conversation starter for party, entertaining or wedding registry. OUR CUSTOMERS SAID: "Perfect coasters! They grip to nearly all surfaces with ease! Good for hot and cold products. Ended up buying another set of these after I received the first pack and realized how great they were!